1. 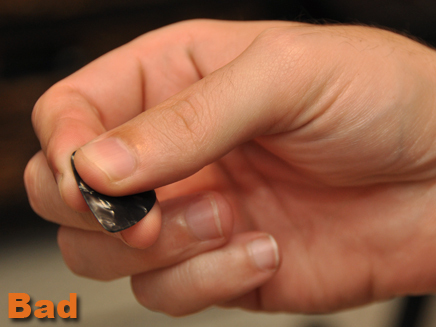 Never hold your pick with more than two fingers. You should only be using your index finger and your thumb as shown. 2. Never put the palm of your fretting hand against the back of the neck. 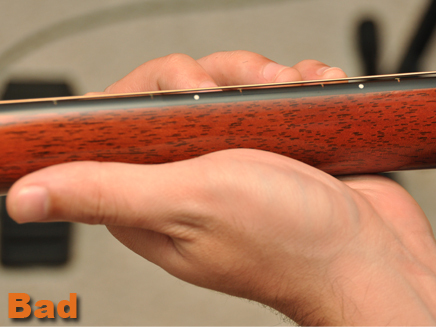 Although there is an advanced technique that involves fretting notes and muting strings with the fret-hand thumb. This technique is unique to players with very large hands like Jimi Hendrix and Stevie Ray Vaughan. Most of you should not use this technique because it severely limits your ability to reach with your pinky. 3. 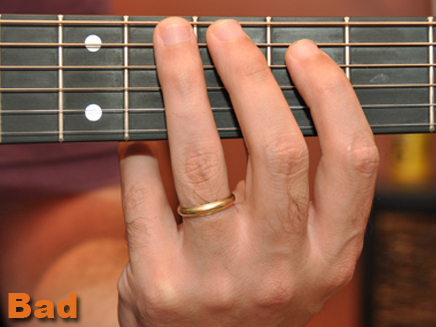 Never tuck your fret-hand pinky finger under the neck. 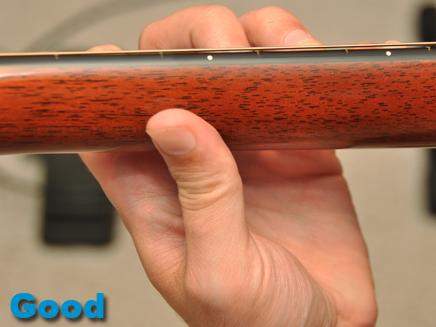 Although you may curl your finger into your hand when it isn’t needed, I recommend trying to keep it out over the fretboard as much as possible so it is ready to go. 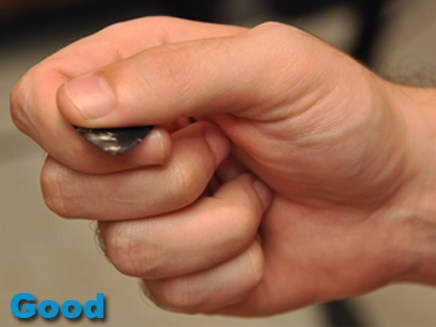 Under no circumstances should the pinky be under the neck where your thumb is. 4. Don’t avoid using your pinky. Use your pinky when it should be used. 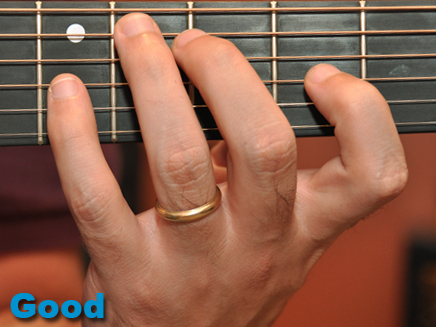 Many blues and rock players avoid using the pinky at all costs until a chord voicing demands it. If you only use three fingers to run through solos and scales, you are limiting your ability to play accurately and quickly. Use your pinky, it will help with #3 as well as make you a better player. 5. Never practice without a purpose. When you practice make sure you have a goal in mind for your practice time. Many players just pick up the guitar and jam. Although this is fine some of the time, you should try to set a goal each time you pick up the guitar. It doesn’t have to be complicated. It can be simple like, “I’m going to learn the chord progression to this new song I like,” or “I’m going to play all of my pentatonic scale patterns.” If you practice with a goal in mind you’ll see results sooner. I’m not one for rules and I like to be open-minded about new ways to do things. But these 5 no-nos should be avoided at all costs. If you do so now, you’ll save yourself lots of time later correcting these bad habits. ← Intro riff to “Nobody Else” by Los Lonely Boys.